I'm lucky to say that I don't have a ton of regrets in my life. Not that there are none, but no one's going to make a movie-of-the-week about my life, either. Pretty standard skeletons here in the Crazed in the Kitchen closet. Go to Blogger Idol and vote for Crazed in the Kitchen! Write about a chance that you regret not taking, or a chance that you had, that you didn't take, that may have turned your life in a totally different direction. What if I had taken that Photography class junior year of high school instead of Journalism? Would I have ended up going to a different college (I went to a journalism school), had different friends, a different job and family now? Hmm. Interesting to think about for a bit, but probably not much of a post. Ooooh, I know, what if I write about that time when I was eight years old and I got to get up on stage and play Bozo Buckets on TV on the Bozo Show? What if I had been just a bit more careful and hadn't missed bucket number one? (Yes, that happened, and yes, it was horrifying.) Probably would've been discovered as a child actor and would be eating raw vegan food with Gwyneth Paltrow right now. Right? Well, you'll just have to head over to Blogger Idol to read my post and find out more. And please vote for me, Crazed in the Kitchen, while you are there! Loved your post! I voted for you! You are doing a great job! It's nice to have few regrets. When I think about it, I think I have few also. What I've done in the past has led me to where I am in life. And I love my life right now. 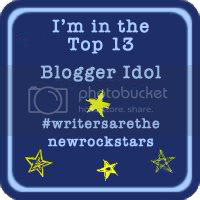 I have not heard of blogger idol- I will have to check it out. Although, my personal opinion is that I don't like to think about regrets... no one can really tell what would have changed. Although now that I say that, one regret comes to mind for sure- buying a house in 2007 before the financial dump! Thanks, everyone! I am lucky and blessed to have a wonderful life--even with its ups and downs--and I wouldn't be here if I hadn't made the choices I did. I appreciate all your comments and votes!